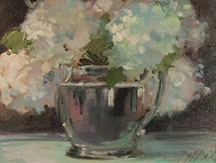 A very popular class will cover the basic principles of oil painting with regard to painting BIG BEAUTIFUL florals. Includes interesting and memorable discussions on composition, massing, building form, light and shadow: and depending on your own style, knowing when a work is finished (learning how to not overwork your painting). Douglas delivers sound principles of painting that are an incredible foundation for your painting, whether a beginner or seasoned professional. After the brief morning intro, a very hands-on approach to the class, gets students mixing colors and preparing to paint. Students will work in their own style/technique so that the finished work is their own. Douglas will overview his palette and concepts that his work entails. Students will mix paints and learn to mix basic strings of color to help comprehend how this preparation makes the painting process a little simpler and gets a working understanding of the value/strings of color. Peonies, Lilacs and Hydrangeas will be the main focus, although some other florals will possibly be included. Students will paint from a mixture of actual still life set ups and from photos Douglas provides, depending on what might be available in Florida at this time of year. An incredible 3 day hands on painting experience will yield a good number of paintings and a logical thought process in a fun yet focused atmosphere to help you guide your future study. Your paintings can be as complicated or as simple as needed. Demos and individual discussions/instruction will help each student to start to begin to reach the preliminary goals they are striving to meet. 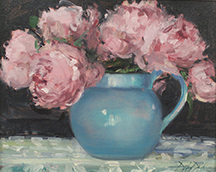 Plan to produce several studies and at least one or two larger, more finished paintings, depending on skill level. Plan to bring notebook/sketchbook and enjoy some demos along with some great stories to help you remember the principles that are the foundation of Douglas’ teaching. All of second day: Paint in studio. Douglas moves through the group in a rotation so everyone gets equal time. Day 3 1st hour: Overview/Review Specifics. Most of third day: Paint in studio. Douglas moves through the group in a rotation so everyone gets equal time.